Kenny McMullin was born in 1940 in California. He enlisted in the California Army National Guard on February 21, 1960, and went on active duty in the U.S. Army as a Combat Engineer on December 31, 1962, serving until December 14, 1965. SP5 McMullin served in the U.S. Army Reserve from December 15, 1965, until returning to active duty on January 31, 1966. His next assignment was as a Demolition Specialist with Company E, 7th Special Forces Group at Fort Bragg, North Carolina, from April to December 1966, followed by service as a Demolition Sergeant with Company B, 5th Special Forces Group in South Vietnam from December 1966 to October 1967. Sgt McMullin served as an Operations Sergeant with the 5th Special Forces Group in South Vietnam from October 1967 to September 1969, and then as an Intelligence Sergeant with the 46th Special Forces Company in Thailand from September 1968 to October 1969. His next assignment was as an Operations and Intelligence Sergeant with the 6th Special Forces Group at Fort Bragg from October 1969 to January 1970, followed by service with Company C, U.S. Army Special Forces Training Group at Fort Bragg from January 1970 to March 1971. 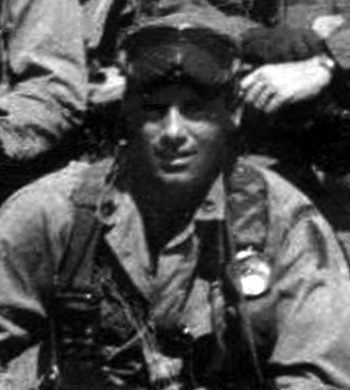 During this time, SSG McMullin served on Action Element #2 with the Blueboy Assault Group during the Son Tay Raid, a clandestine mission to rescue American Prisoners of War in North Vietnam on November 21, 1970. He served as a Reconnaissance Team Leader and Airborne Controller with the U.S. Army Vietnam Training Advisory Group in South Vietnam from March 1971 to February 1972, and then served as an Intelligence NCO and Training NCO with the 46th Special Forces Company and the U.S. Army Special Forces Training Group in Thailand from February 1972 to March 1973. His next assignment was as the Senior Special Forces Instructor with the Special Forces Detachment at the U.S. Army Institute for Military Assistance at Fort Bragg from April 1973 to March 1975, followed by service as Operations Sergeant and then Assistant Chief Operations NCO with the 82nd Airborne Division at Fort Bragg from March 1975 to November 1976. MSG McMullin served as an Operations Sergeant with Company A, 3rd Battalion of the 5th Special Forces Group at Fort Bragg from December 1976 to August 1982, and then as Operations and Training NCO with Headquarters Joint Special Operations Command at Fort Bragg from August 1982 to September 1984. His next assignment was as Detachment Sergeant Major and then Company Sergeant Major with Company A, 3rd Battalion of the 7th Special Forces Group at Fort Davis, Panama, from September 1984 to December 1989, followed by service as Company Sergeant Major with Company B, 1st Battalion of the 7th Special Forces Group at Fort Bragg from January 1990 to January 1991. His final assignment was as Battalion Command Sergeant Major with 2nd Battalion of the 3rd Special Forces Group at Fort Bragg from January 1991 until his retirement from the Army on November 1, 1992. Kenny McMullin died on December 25, 2011. For gallantry in action on 21 November 1970 as a member of an all-volunteer joint U.S. Army and Air Force raiding force in the Joint Chiefs of Staff-directed heliborne assault mission to rescue United States military personnel held as prisoners of war at Son Tay prison in North Vietnam. This valiant effort was motivated by deep compassion for his imprisoned fellow men-at-arms, and by a strong sense of military duty and national pride. After debarking from the assault helicopter, Sergeant McMullin moved to an exposed position and delivered automatic rifle fire on a fortified enemy position, eliminating an immediate threat that could hinder the search and rescue operation. He then fearlessly moved to the north corner of the prisoner interrogation building the better to protect the search team of his element. He cleared the area of the remaining enemy personnel permitting the safe completion of the search of all buildings and the withdrawal of the raiding force to the extraction point. Sergeant McMullin's conscious disregard for his personal safety, extraordinary heroism against an armed hostile force, and extreme devotion to duty are in keeping with the highest traditions of the military service and reflect great credit on himself and the United States Army.